As a human rights advocate, I am concerned about two main problems in the way we approach international human rights today. First is the problem of politicization. By this I don’t mean the way authoritarian states exploit the human rights system in order to pursue a political agenda. I mean that the very idea of human rights upheld in international institutions is politicized. When you listen in on debates in human rights institutions today you hear mainly about social policy questions, about how public resources should be redistributed to change societies for the better. We need those discussions, but they are not discussions about human rights, that is, about protecting individual freedom from coercion. The core challenge of ensuring political freedom occupies only a small, and shrinking part of today’s human rights discourse, which is thoroughly saturated with partisan ideology. The second, and clearly related main problem of international human rights is the sad and embarrassing state of international human rights institutions, especially the UN Human Rights Council, but also other forums. The rule based, inclusive, democratic and multilateral approach to human rights has been thoroughly befouled by states that do not believe in human rights, states that use membership in human rights institutions in order to protect ruling cliques; in order to perpetuate their oppressive policies; and in order to denigrate and undermine free societies. Multilateralism in human rights has resulted in bureaucratic paralysis and the undermining of principles. Both the meaning of human rights, and the way we seek to protect human rights, are clearly in trouble. Meanwhile, freedom is in retreat around the world. For example, recent studies by the Pew Foundation have shown that 83% of the world’s population now lives under conditions where there are “high or very high levels of overall restrictions on religion”—either through government policies or the failure of governments to protect members of threatened groups. The most targeted groups were Christians (in 144 countries), Muslims (142 countries), and Jews (in 87). What is more, and despite the enlarging human rights bureaucracy, and the expanding human rights agenda, we are failing to address major human rights and humanitarian problems, like in Yemen, where 14 million people are beginning to starve, and in Syria, where half a million civilians have been killed. Our approach to human rights needs to be reformed, and in this situation, and at junctures like this anniversary, it is appropriate to reflect about the founding documents of the international human rights system, what they say about the nature of human rights, and to take guidance from those principles as we look ahead. The Universal Declaration of Human Rights is clear that the basis for human rights lies in out common human nature. The first article of the document starts by stipulating fundamental facts about human beings. The first sentence of Article 1 asserts, without explanation or justification, that all human beings are, in decisive respects, the same. It names essential qualities that all human beings share, and it implies, by this short list of common qualities, that they are the ones of paramount importance to the purpose of the document in identifying human rights. Like the Ten Commandments, the Declaration thus prefaced a set of moral norms with facts that justify and compel adherence to the specific rules that follow. The first two Articles of the Declaration are considered the “cornerstone” of the foundation of the modern human rights system. But they, in turn, rest on principles put forth in the Preamble. The Preamble of the Declaration starts, in its very first phrase, this way: “Whereas recognition that the inherent dignity and the equal and inalienable rights of all members of the human family is the foundation of freedom, justice and peace in the world…” In the next paragraph, the Preamble blames “disregard and contempt for human rights” for the “barbarous acts which have outraged the conscience of mankind,” referring of course to the Holocaust and other crimes against civilians during World War II. It was a warning. And like the Law in our common religious tradition, the Declaration can be seen as both “a blessing and a curse,”[i] for the Preamble, in blaming the brutal and tragic atrocities of the war years on disregard for human rights, suggested that without respect for the principles contained therein, more of such ruinous behavior would follow. Indeed, it has. When the Universal Declaration states that “All human beings are born free and equal in dignity and rights,” these few words stand as a monument to the most revolutionary and emancipative idea in human history, the idea that mankind is accountable to transcendent and universal laws of nature, and that in order to adhere to this Natural Law, authorities must respect our Natural Rights. These concepts, articulated first by the Stoic philosophers of Ancient Greece and Rome, form the foundation for the idea of human rights itself. Freedom and equality are not the invention of some particular political order, an arbitrary, local “value”; they are natural to all people. The Chinese communist state claims to uphold human rights “with Chinese characteristics,” but the Declaration affirms that infants born there are owed by that regime the same rights and freedoms as those born anywhere. The Holocaust and the enslavement, torture and murder of other innocent civilians moved the primary authors of the first two articles to throw down a moral gauntlet to the world, declaring in effect that human rights violations were not just violations of law, but were crimes against the cosmic moral order that is embedded in nature. The principle of human rights is transcendent, immune from mutation by politics. It needs to be codified and enforced in law, but human rights are more, and different than the positive laws rooted in the values, customs, and traditions of states. As rooted in nature, human rights don’t change. They are Natural Rights, not rights bestowed by society. Our tradition, the Western tradition, could give birth to the idea of the universality of human rights because it rests on both a rational Greek vision of the moral equality of all humans, and the Old Testament teaching that since we all share common ancestors, no natural divisions or hierarchies obtain. Our moral leaders are people who, like Moses and Jesus, and Lincoln and Mandela, weren’t noble-born, but rose from obscurity and adversity by the force of their genius and charisma. We are all subjects of the same transcendental deity or moral order, we are all accountable to the laws of nature, and, as signaled by the idea of dignity, we owe to others the respect sue to an equal. Article 2 of the UDHR, which is commonly termed the “universality provision,” lays out how the human rights principles in Article 1 are to be implemented: equally and without discrimination. Article 1 spoke of our common human nature as a basis for human rights. Article 2 says: People are different; deal with it. It is another oblique reference to the classical foundation of human rights, for in the ideal state envisioned by the Stoics, virtue was the only criterion for citizenship; no other distinctions were relevant. [ii] Before enumerating the specific human rights that governments must protect, the Declaration makes clear that any political system honoring human rights cannot uphold legal inequalities, and discriminate as regards the entitlement to human rights and freedoms. It reflects an unambiguous embrace of the principle of formal equality: According to the principle of equality, governments are bound to a posture of neutrality, preventing them from disadvantaging individuals on the basis of their characteristics. The law must ignore our differences, and treat us as human beings, as such; the society respecting human rights needs to be a society upholding the fundamentals of liberalism in recognizing the fact of human diversity. But today, in reflecting on the meaning of the Declaration, we need to recognize how, the foundational principles of Articles 1&2 have been violated by the list of human rights that followed, specifically by economic and social rights. While the Articles grounded human rights in Natural Rights, as negative liberties that could be upheld by all states without delay, and regardless of their economic differences, those rights are not innate freedoms to which we are entitled by nature, or our Creator, but to material services by states, in a sense equating governments with transcendent moral forces. They are not Natural Rights; they are not prior to the state, but they depend on the state to be realized. As a result, human rights are increasingly thought not to be Natural Rights based on Natural Law, but rather rights based on the positive laws of rulers and legislatures. And as much as we revere the Universal Declaration, we should acknowledge that it has encouraged an erosion of the idea of human rights as grounded in nature, and as sacrosanct. In my view, this is a major reason for the politicization of human rights today. International human rights today deal increasingly with the positive obligations of states to intervene in society, supposedly to promote freedom and equality, but international human rights is now associated with the global regulation of larger and larger spheres of social and economic life, and indeed, with restricting individual freedom, for example by embracing hate speech legislation. Human rights are today the foundation for a form of globalist utopianism, but this was never part of the Stoic vision of a cosmic human community united by a common humanity. The Stoic idea of global moral citizenship was never an endorsement of a world state,[iv] and moral brotherhood does not imply a world without political boundaries. But with the interpretation of human rights as positive law, these ideas have given way to a movement toward centralized global regulation. And the sense of the unity and brotherhood of humankind, to which the Universal Declaration referred, and which the Stoics saw as rooted in nature, has been eroded by modern human rights where we find a proliferation of human rights legislation addressing the rights of groups. In conclusion, I want to share something said by James Baldwin, the Black American writer who died in 1987: "Not everything that is faced can be changed. But nothing can be changed until it is faced." We need to reacquaint ourselves with the concepts of Natural Law and Natural Rights, and to focus human rights advocacy on the protection of individual freedom. And the few liberal democracies in the world need to realize that the idea of universal human rights need not imply universal membership in human rights institutions. They need to promote human rights bilaterally, and in alliances with one another. They need to inspire and support citizens in oppressive states to change their regimes. We, as citizens of free countries, need to elect leaders and governments who will stand up to dictatorships and place themselves firmly on the side of freedom, and those seeking freedom. And we, as members of civil society, need to reform the idea of human rights. Aaron Rhodes is a founder of the Freedom Rights Project, a human rights research initiative and think-tank. He was formerly associated with the Institute for Human Sciences (IWM) and the International Helsinki Federation for Human Rights (IHF), which he led for 14 years between 1993 and 2007. 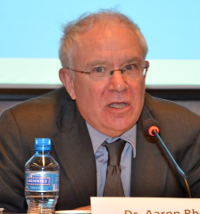 In 2008, he and colleagues established the International Campaign for Human Rights in Iran. Since 2014, Dr. Rhodes is president of FOREF Europe (Forum for Religious Freedom Europe), an independent Vienna based human rights group with special focus on religious freedom advocacy. He recently published “The Debasement of Human Rights” - How Politics Sabotage the Ideal of Freedom. [ii] Martha Nussbaum, Forward to Schofield, Malcolm, The Stoic Idea of the City, Chicago and London: University of Chicago Press, 1991, xii. [iii] I thank human rights advocates Dimitrina Petrova and Willy Fautré for their advice on this point.